Celebrate the final weeks of the Winnie-the-Pooh: Exploring a Classic exhibition this Winter with free making activities for all the family including early years on Sundays. 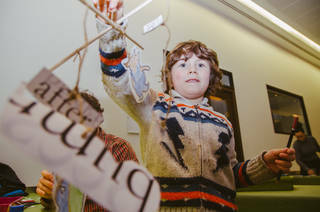 Create your own mobile inspired by a classic children’s story or a storybook and see your tale come to life on the page. Make words bounce and climb around your favourite scenes. Download the Winter schedule for further details. Led by the Drop-in Design team. Please note this activity is only running on Sunday 8 April.